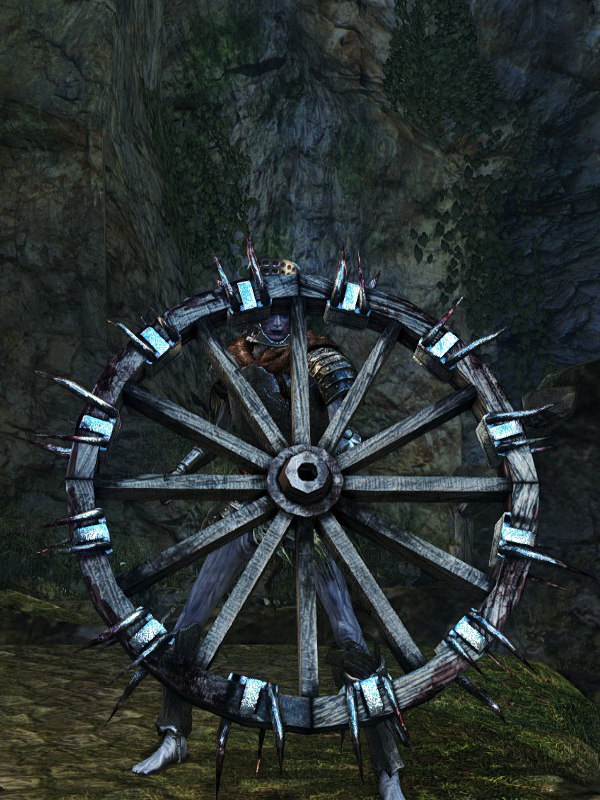 Giant wooden wheel encircled by spikes. Half-melded to a strange skeleton. weapons with a good spin. Strange indeed! The R2 attack is multi-hit. It is surprisingly damaging (though not very practical as you can't move for a while) if the shield has been modified into a Fire or Lightning version. Shield durability reduced to 20. Base damage increased. Cannot repair weapon (except through reinforcement). 2. At around lvl 20 INT, a +15 bonewheel shield with Crystal Magic Weapon cast upon it does roughly the same amount of damage a +10 fire/lightning weapon does. So once you get higher than 20INT the +15 bonewheel shield is the strongest.